The Speed 5's predecessor was the Speed 3, a fast long distance racer and uptempo shoe that sat alongside shoes like the Nike Streak 5 and Adidas Adios series. The Speed 5 is a bit different in that it has gained an ounce and now functions far better as a lightweight trainer. Version 5 sits at 8.4 ounces with a firmer, responsive sole called Recoil (which appears to be EVA). There is a 6mm drop which lends the shoe to feeling a bit faster. The outsole has full ground contact but really only has flexibility through the forefoot. 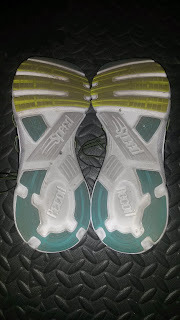 This is a design Salming calls TGS 62/72, which they state creates additional stability (by what appears to be via a lack of flex grooves) for 62% of the heel to the forefoot, then having flexibility and a slightly offset flexibility line of 75 degrees to supposedly work with the foot's natural flexibility. The forefoot does have deep flex grooves and flexes nicely upon toe off while the heel and midfoot are stiffer due to the lack additional grooves. This can be a good or bad thing depending on the runner and to me feels odd at first. This is Salming's way of attempting to guide the foot in the forward direction and promote stability in supposedly correct places. The Speed 5 does have a curved heel, which is something I look closely for in most of my running shoes to smooth out landing and match the shape of the posterior calcaneal (heel) bone. However, the heel curve is centered in the middle of the heel, rather than being at the posterior lateral aspect (where a majority of people land). This can feel jarring at first for those that land in the posterior section of the shoe. This is another attempt I believe by Salming to center the foot during landing, but considering most people landing in an inverted foot position in order to allow room for the natural shock absorption of pronation to occur, it seems a bit odd. For those that land forefoot first, this will not be noticeable except during walking. 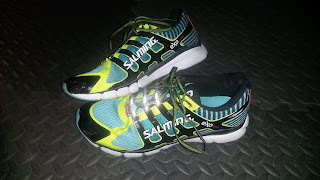 Salming has a surprisingly high volume fit in the midfoot and forefoot. I was surprised that I needed to cinch down the laces quite a bit to get the locked down fit I am used to. 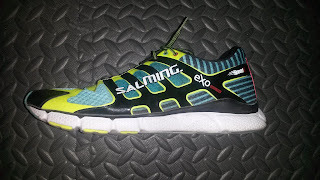 My colleague and guest blogger Dr. Kolias recently tried the Salming Enroute and with his narrow foot, warned me of the higher volume fit. I, with a more medium width foot, still had to cinch down the laces. The heel does fit fairly well as long as I rework the laces into a lace lock style. The forefoot fits higher volume and I have had no pinching issues. Per Salming, they say the forefoot is designed to be wider to give more of a natural fit. While I applaud them for this attempt, I must comment on the fact that while the width along the metatarsals is well above average, the toebox does taper somewhat quickly after that. It is not the most drastic I have seen, but taper on the medial side is noticeable. The exoskeleton utilized is a firmer version of what many companies have done in the past. The exemption being that it is far firmer and encomposes more of the foot than things like Flywire. The goal of the exoskeleton and the double upper layer is to provide more structure around the upper in an attempt to keep the foot to the platform and per Salming create more stability. While this seems great in theory, what occurs with the Speed 5 is a somewhat heavy upper that takes a while longer to break in. Once the laces are cinched down, I do appreciate the lock down. The problem with the exoskeleton is that it took some time (~50 miles) to break in and gave me a good sized blister on my medial arch (right side only). While I think this is an interesting way to provide more structure to the upper, I would suggest using a more elastic based system to improve the customization of the fit, rather than the stiffer exoskeleton which may not flex in exactly the right spots as needed. On a side note, there is a decent heel counter that attempts to create a good hold on the calcaneus. It is not overly stiff as I have had no issues with it (I tend to be sensitive to these things) due to some cushioning used around the heel collar. So for those with sensitive heels I would not be overly concerned. Finally, the Speed 5 fits fairly true to size, so I would go with whatever you normally wear. The altered sole flexibility is one of the many ways you can provide "stability." 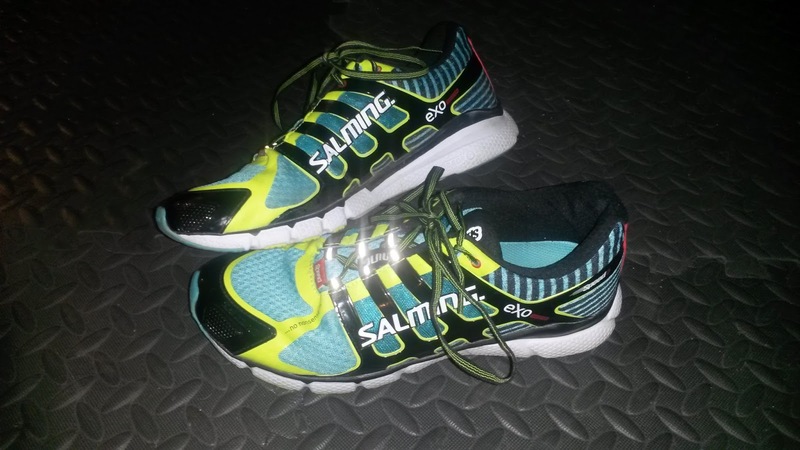 In the case of Salming's design, they attempt to create the path of least resistance in the forward direction via flexibility forward in the forefoot and less in the heel and midfoot. A majority of other companies attempt to do this with additional foam density on the medial (or rarely lateral) sides of the foot in an attempt to guide the foot forward (aka posting). I must emphasize that stability by no means controls the foot, which has been clearly shown by research. The only issue with this if an individual is compensating with a joint at the midfoot or hindfoot for an issue elswhere and you take that away, that compensation will have to go somewhere else or return to the source. For those that load forces heavily at the rearfoot, either at the subtalar joint (part of where pronation and supination motions come from) or more at the midtarsal joints (aka where most people associate the midfoot) during initial contact, that force has to be taken up somewhere. That somewhere will likely come either by collapsing the first ray (medial bones of the foot up to the first toe), excessive dorsiflexion at the ankle or excessive rotation at the knee. This is not exclusive to Salming's design and applies to all variations of attempts to stabilize the midfoot or heel (or any part of the foot). The questions have to always be asked "Why are you attempting to stabilize this area?" and "Why is there extra motion in this area in the first place?" It may come from joint hypermobility or lack of muscular control of the posterior tibialis or peroneus longus (two of the major stabilizers of the medial arch and foot) or it may even come from higher up the chain (like the hip). However, it can also come from a lack of motion elsewhere as well. This is what accounts for those individuals who have additional knee or foot pain with an orthotic or stability elements in the shoe. Those people are compensating at those joints, and now you have taken away that compensation and put forces back in an area that currently is impaired! Thus it can make issues worse. For those that have weakness or excessive mobility, orthotics or stability are great while they work on muscular stability. So stability cannot just be blindly given. 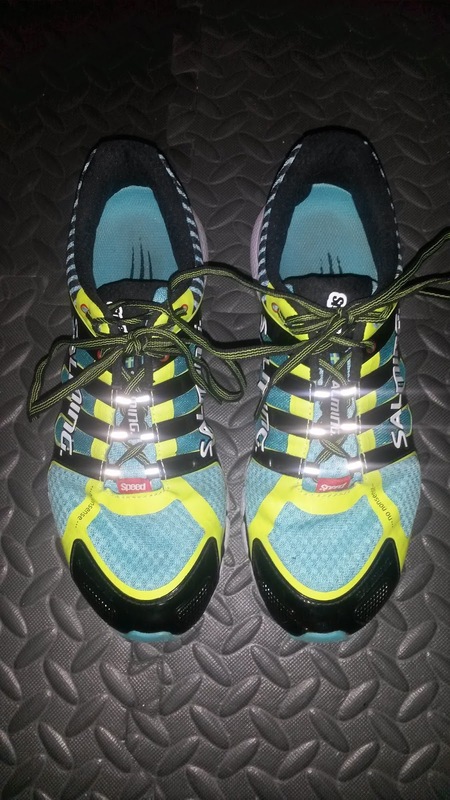 The elements of the Speed 5 are fairly minor, but due to the lack of flexibility in the midfoot and heel, know that some people who load heavily there may feel a bit of discomfort. 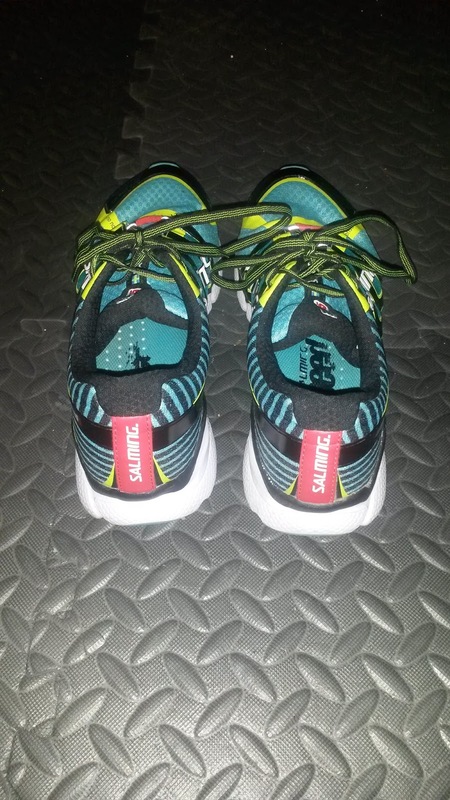 I would suggest this shoe more for individuals with neutral foot mechanics who may benefit from a little extra stabilization when they fatigue. 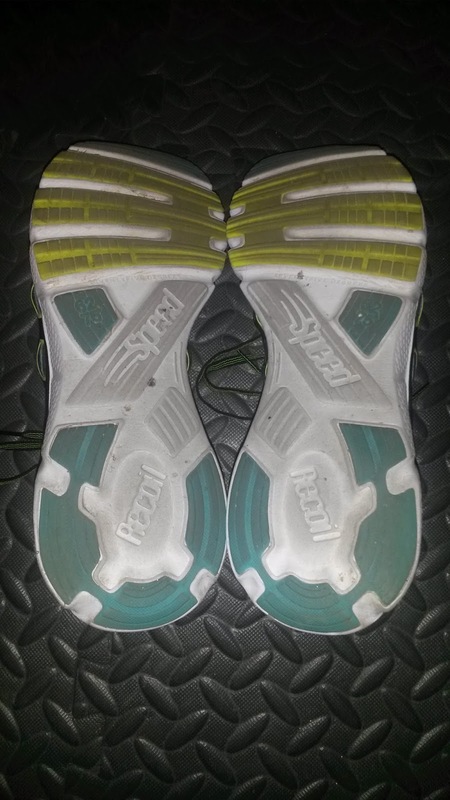 The Speed 5 has worked well for me as a lightweight trainer, workout and uptempo long run shoe. It has enough cushioning to handle daily miles while being lightweight and having a responsive enough midsole to handle workouts as well. For those looking for a ton of cushioning or a racer, this is not the shoe I would look to. For those used to heavier shoes, this might work well as a marathon shoe, but I would prefer lighter like the Adios or Streak series. For those that have higher volume feet, I would definitely take a look at Salming shoes as they seem to have a bit more volume, especially in the midfoot. For those with narrower feet, you're either going to have to cinch down the laces or wear thick socks as there is a good amount of room throughout the shoe. The concepts brought to the table by Salming are interesting and the Speed 5 has been a great lightweight trainer and uptempo shoe for me. 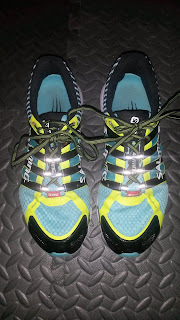 This is more of a shoe that I would suggest for neutral runners or those in need of very minor stability elements without the use of traditional posts looking for an uptempo shoe. This is not a stability shoe, just a shoe that incorporates some possible elements that may mimic that. The higher volume fit separates this shoe from many of the other lightweight trainers out there and for those that need more room, take a look. 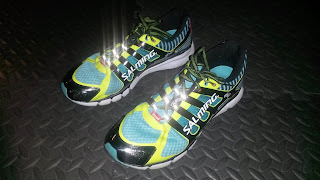 Salming has intrigued me and I look forward to trying more of their shoes. 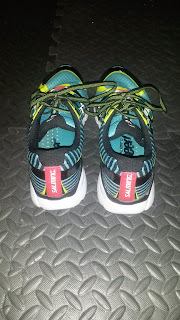 ***Disclaimer: These shoes were provided free of charge by Salming North America for winning a Facebook Giveaway by Stefan Albinsson. This did not affect my opinions in this review. I put at least 75 miles on trainers and 25 miles on racing flats. Currently I have 105 miles on my pair.